We all have loved the cartoon character hello kitty right from childhood, especially girls as it has a lovely pink color scheme and most of us have seen the cartoon drawn in tee shirts, toys, accessories and stuff. There are now rooms solely with the theme. You may also see kitty room designs. This is a pretty and cute small bedroom that has the hello kitty design. The design is super lovely as the curtains are in hot pink against pure white windows. The wall right upto the bed features a large cartoon frame. The bedding also has the theme of hello kitty! 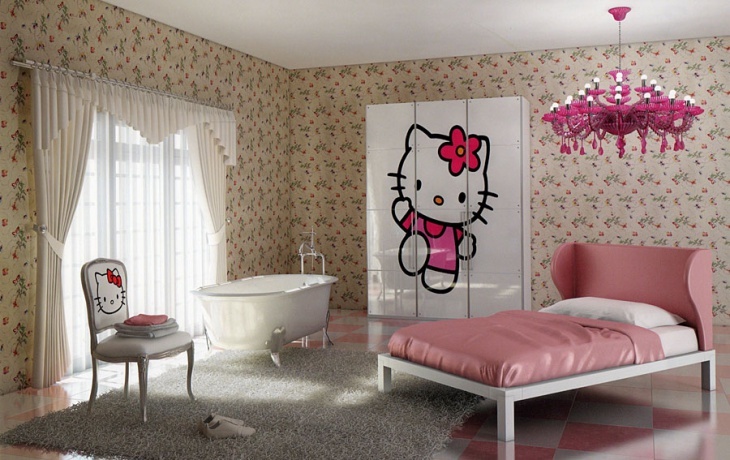 This is a contemporary bedroom with hello kitty design and is absolutely stunning. 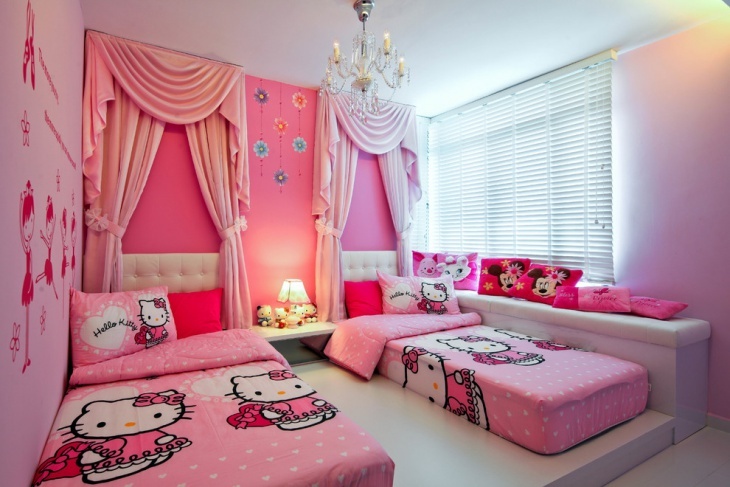 The room features two separate single beds with beautiful hello kitty beddings. It has a chandelier on top and has curtains against a gorgeously painted pink wall. It also features cute little hello kitty toys placed in between two beds. This is a cute little single bed with cupboards and showcase, and all of it features hello kitty themed toys and showpieces. It has a hardwood flooring and quilted headboard. It has several hello kitty pillows and blankets with slip-ons in the hello kitty theme. All in all, it is a super pretty bedroom with the hello kitty theme. This Hello Kitty master bedroom is lovely with all the pink hues, the décor matches perfectly with the theme of the room right from the bed style to the walls and the other. It also features several cute toys in the hello kitty design which is perfect for cuddling for the kids. This is a pretty elegant Hello kitty bedroom featuring a wall décor with the theme. The walls have a beautiful floral design wherein in the center the cute hello kitty theme has been incorporated. Besides, it features a single bed with a pink bedding and headboard. This is a modern bedroom with hello kitty design featuring a bed whose head is exactly shaped as that of the hello kitty. It features a hot pink rug placed against a hard wood flooring. It also has cute little wardrobes, side-tables, and mini cupboards with hello kitty design and color. This is a very awesome hello kitty themed bedroom which is also very spacious with a unique design. 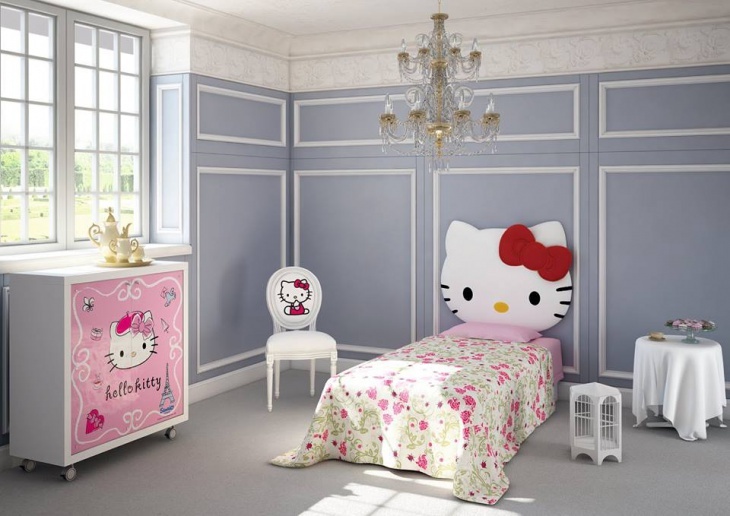 It features a red and white hello kitty bed and wardrobes with the same theme. It is a cottage style bedroom with a wooden railing and floors and contains several items that have the hello kitty design. This is a modern bedroom with decorative hello kitty design featuring a bed with a hello kitty bed head with a cute red-colored bow. It also features a red chair, a pendant light in red and lovely blue cabinets with a hello kitty design. It is a minimalist kids’ bedroom with a pop of funky décor. This hello kitty bunk bedroom features a double-storey bed with pink striped walls and cute décor, in pink and white. The beddings are also in pink and white with hello kitty cartoons in the pillows. It also features two cute couches with pink striped pattern and hello kitty cushions. 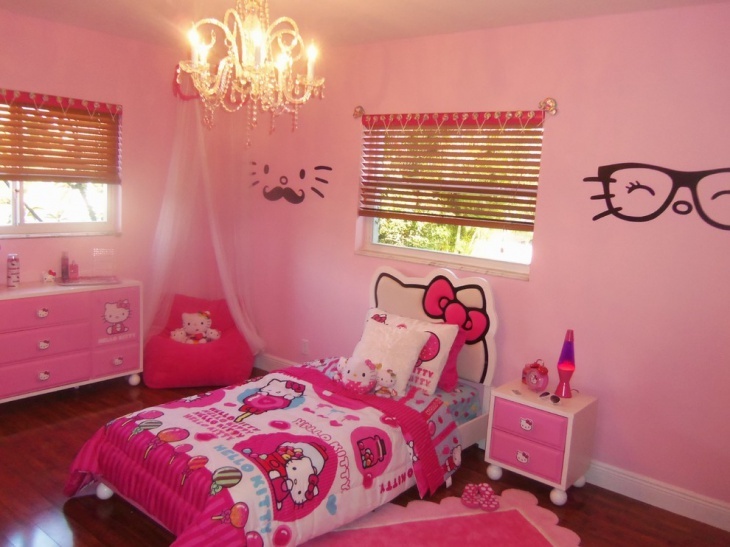 This is a princess themed hello kitty bedroom which has very pretty and elegant décor. It features a beautiful chandelier light, fall curtains, pink couch with hello kitty cushions, side tables and much more. It is a pre-teens bedroom which means it is not all kiddy but contains funky stuff which can be used even after becoming a teen. Children, especially girls love funky colors and pink stands as the top favorite amongst them. Hello kitty is one such awesome cartoon design that is used as décor choice in bedrooms. In fact, most teenage girls are obsessed with this theme. This cute theme is also incorporated in nail arts and is very much trending among the teens and kids. You may also see childrens bedroom designs.